The World Health Organization (WHO) is convening an emergency meeting on 18 May 2018 to “consider the international risks” of the latest outbreak of the deadly disease Ebola, which has now moved to an urban area of the Democratic Republic of the Congo (DRC). UNICEF/Naftalin | Health workers prepare to treat suspected Ebola patients in Bikoro Hospital in the Democratic Republic of the Congo. One new case of Ebola virus disease has been confirmed in Mbandaka, a city with a population of about 1.2 million, WHO confirmed on 17 May 2018, raising fears that despite a rapid response by authorities, the outbreak has not been contained. 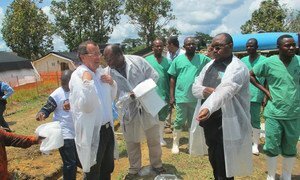 “The arrival of Ebola in an urban area is very concerning and WHO and partners are working together to rapidly scale upthe search for all contacts of the confirmed case in the Mbandaka area,” WHO Regional Director for Africa, Matshidiso Moeti, said in a statement. First symptomsgenerally include the sudden onset of fever, fatigue, muscle pain, headache and sore throat. This is followed by vomiting, diarrhoea. (SOURCE: UN).